Fiber optic joints or termination is a necessary process when installing a network. Every network operators who aim to deploy a next-generation fiber network have to determine how to build a flexible, reliable and long-lasting infrastructure at the lowest possible cost. In general, there are mainly two fiber optic termination methods: splices which create a permanent joint between the two fibers, or connectors that mate two fibers to create a temporary joint. When people decide to use either method, many factors should be taken into account. Today’s article will evaluate both methods from the aspect of cost to help you choose the effective termination method. Besides the features of low loss, minimal reflectance and high mechanical strength, fiber optic termination must be compatible to the environment in which they are installed. Before we come to the cost comparison of these two termination methods, let’s firstly have a brief overview. As it known to all that, splices create a permanent joint between two fibers, so its use is limited to place where cables are not expected to be available for servicing in the future. The most common application for splicing is joining cables in long outside plant cable runs where the length of the run requires more than one cable. There are two types of splices, fusion and mechanical. Fusion splicing is most widely used as it provides for the lowest loss and least reflectance, as well as providing the strongest and most reliable joint. Fusion splicing machines are usually called fusion splicer available on the market that splice a single fiber or a ribbon of 12 fibers at one time. The above picture shows how to splice a fiber optic jumper. Virtually all single-mode splices are fusion. Fusion splices are made by “welding” the two fibers together usually by an electric arc. To be safe, you should not do that in an enclosed space like a manhole or an explosive atmosphere, and the equipment is too bulky for most aerial applications, so fusion splicing is usually done above ground in a truck or trailer set up for the purpose. Pre-termination is the alternative termination method popular on the market. Cables and fibers are terminated to a connector in the factory. When carefully planned, splicing jobs for specialized technicians can be limited to the network construction phase. But provisioning, churn and network testing can be performed by technicians without specific fiber skills, because the organizers can be very simple. With pre-connectorized products, the connection time is reduced from 20 to less than 5 minutes, including the connector cleaning step. When connecting fibers with connector technology, there is no issue of environmental sensitivity. What’s more, connectors are accessible on the outside of the network element, reducing the need to access a product and the risk of disturbing other lines. The image below shows the MPO pre-terminated cables. The start-up costs for the fusion splice are significantly higher, as fusion splicers can be very expensive. Even the cheapest fusion splicer will cost nearly $2,900 (FS-F600 Fusion Splicer from FS.COM) more than the most expensive crimp kit. Not counting the initial start-up costs, splices will run anywhere from $7.20 to $8.25 per splice, which is much lower than the pre-terminated connector. The following image shows the vivid comparison between fusion splicing and pre-terminated system. As for the pre-terminated connector, the most significant advantage is the wire management hardware involved. A pre-terminated connector requires no additional hardware over a standard connector. And it is faster to terminate a crimp connector, saving labor time ($0.75 per splice), and splicing also requires additional material costs in the form of splice protectors ($0.40 per splice). Fiber splicing technicians have specialized training that makes them expensive when compared to someone simply plugging things in. The additional material and closet space for managing splices can cost an additional $6.05-7.10 per connector. But with a little careful planning as to lengths of fibers needed, pre-terminated fibers can be installed quickly and with no training. In all, fusion splicing makes a lot of sense for trunk fibers and locations where there are anywhere from 48 to 192 fibers to splice. In the drop locations, where there may be only one or two splices at each location, the setup time for each location may negate any cost savings from fusion splicing. In comparing pre-termination and fusion splicing, both have their inhered advantages. Fusion splicers offer many advantages in the premises environment, from being lightweight and compact to operating on a battery. These new units minimize setup time and are ideal for use in locations where space is tight. In addition, the total splice and heater cycle time is less than one minute, thereby enabling technicians to move through many termination locations quickly. However, we cannot deny the fact that the start up cost of the fusion splicing is huge, thus customers that can’t deal with budget are going to demand pre-terminated connectors. Pre-terminated solutions offer the most benefits: It’s easy to install pret-terminated cables, and because they’re available in custom lengths, it’s easy to get the exact lengths required to limit the excess slack. Many more users will rely on the pre-terminated trunk cables and sacrifice the inconvenience of dealing with slack, because it offers faster deployment. 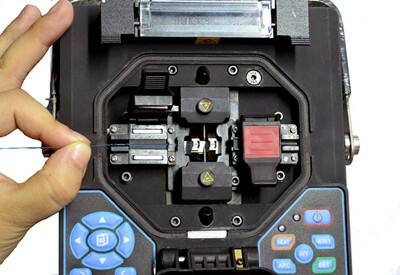 As you get into significantly higher fiber counts, fusion splicing could save time over installing connectors. While for those who don’t have a fusion splicer or splicing experience, may want to consider pre-terminated connectors. FS.COM offers both fusion splicer and per-terminated cables, our products are integrated, holistic physical infrastructure solutions that guarantee a reliable and stable performance for your network. Please contact us if you need help.